The landscape grid is grossly inaccurate. According to the grid one of my keywords should get 50 impressions a day for $1.10. For the new Callout Extensions, it would reduce how manual the process currently is if there was a "Select All" button to add all callouts to a campaign at once. Right now clicking through is very manual, on top of how manual it is to do this campaign by campaign. Get reviewers that have an I.Q. above 70 and aren't power mad. Reviewers can't seem to comprehend the fact of branding and product marketing as well the simple fact that two urls can point to the exact same place, but have different limitations. Bing policy doesn't prohibit this, but the limited capabilities of current reviewers improperly discriminates against advertisers - which also deprives Bing of advertising dollars as a result. Sad and foolish. Counterproductive. there are big chunks of the UK missing from your city and town selector. The city of Stockport is not on there and the county of Trafford is missing with all its cities. Local businesses like mine have to advertise locally. Wie teuer soll das noch werden ? Ihr braucht Euch nicht wundern wenn Google alles bekommt!! 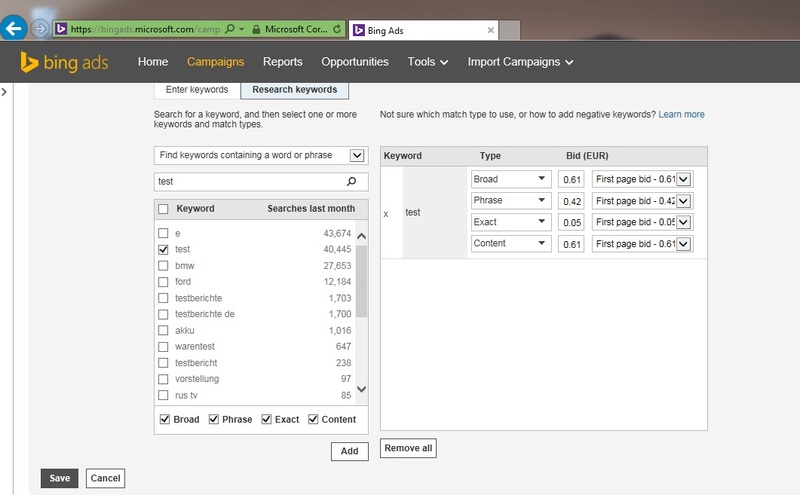 add an easy way to keep keyword searches in the tool instead of deleting them upon the next keyword. no idea why it does this by default. thanks! Did you know at one time Google Merchant/Shopping Beta was actually free for PPC users (over 3 years of free service for user feedback)? Regardless, currently Bing is 3 times the cost when compared to Google Shopping/Merchant. For example, for every $100 that we spend with Bing it will drive roughly 300 clicks, with Google, 1000 clicks. Not to mention the quality of traffic from Google is paramount compared to Bing, giving us a 6% Return on investment from Google, compared to 3% from Bing. So, to make this clear on a small scale, So per 1000 clicks, if our average gross sale is $50, we gross $300 less $100 cost with Google $200.00 gross profit, but with Bing we gross $300 less a cost of $300, gross profit is $0, we break even. Please advise. And please, do not mention any feed or campaign enhancements, our tech team is highly knowledgeable and we tried everything. This is the bottom line. Since at least Months i cant see the KW price without having to click on it. The space is not as width as it should be / was before. Allow more than 50 items to be viewed at once. Currently you can only see 50 items at once. If I am in a view where I should have say, 85 keywords visible to me, I can only see 50 without the page having to load more. Was this done for bandwidth reasons? If I hit CTRL + F, and search for one, and it is near the bottom, I cannot find it. Also, if I want to copy an entire column, I can't hold CTRL and drag the mouse down. After I reach the 50th word, the page loads the next 50, but forgets the first 50. There is no Product Extension created for the campaign. well, make it easier / obvious how to create this! It keeps telling me this but there is no clearly stated way to create a product extension add, turn this notification into a link that takes me to the right page to create a product extension, this is very frustrating! I live in a boarder city of sarnia, Ontario. i would like to appeal to only Canadians since its an industrial company. Please allow the location of user to be segmented in the bing ads interface where we could see at the country, state, city, or zip code level how many people are receiving impressions, clicks, conversions, CPA, ROAS, etc. This would allow us to more easily bid up or down on locations (the location report tab does not allow higher views such as by state or by country, as it lists every city and does not aggregate). Allowing geographical reporting at the state level would be much easier for clients that do not want to get granular at the city and/or zip code level, but wish to have activity data that is actionable. I've recently encountered a situation with negative keyword conflicts were caused by partial matches, e.g. 'old' blocked 'cold and 'mokers' blocked 'smokers'. Please review this policy, i.e. just use match the actual keyword used exactly, not on partials.